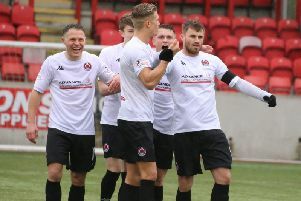 Matthew Flynn and Martin McNiff are among just four Clyde players under contract for next season. Clyde will interview candidates over the next few days as they seek to have a new manager in place by the beginning of next week. The club have been pleased with the response they have had after advertising the post and are in the process of drawing up a short list. Club vice-chairman John Taylor said: “It wouldn’t be fair to mention who is in the frame at this stage, but we’re pleased with the quality of candidates. “They come from the various levels of divisions in Scotland. I’m sure we’ll get someone who suits what we are trying to achieve going forward. It’s understood that Peter MacDonald and Jon-Paul McGovern, appointed interim co-bosses after Barry Ferguson’s departure, are among the applicants. When the pair were appointed it was always envisaged to be a stopgap arrangement to the end of the season. Taylor said: “They’re both relatively inexperienced in that they haven’t managed teams before. They were told ‘go in and do your best and you’ll certainly be encouraged to apply when we advertise the post in the summer. It was always the case that we were going to advertise, it wouldn’t be a surprise to them. “They obviously deserve consideration on the basis that they have been in post for a number of weeks.” Priority for whoever gets the job will be to decide on the future of the vast majority of the current playing staff. Just four players - Martin McNiff, Ewan McNeil, Jordan Lowdon and Matthew Flynn - are on two-year deals and contracted for next season. The rest are on one-year contracts which expire this summer. The vice-chairman admitted: “There’s no doubt the uncertainty over our league position, coupled with the fact we had interim managers in place, have caused us to be a bit behind with that aspect. “You can’t offer contracts to players when there’s not a manager in place, you’ve really got to let a new man come in and make a judgement on those who are out of contract.